10/17/2017–CONCORD, NC–As post-war tensions began to chill the relationship between the forces of the western allies and their former allies, the Soviet Union, an “Iron Curtain” descended on the German capital of Berlin. In June of 1948 these tensions escalated into the first salvos of what would become known as the “Cold War.” The Soviet Union blocked all access into Berlin forcing allied planners to devise one of the most ambitious airlift operations in history. The Berlin Airlift went down as the most successful air bridge operation ever - saving not only the city of Berlin but also serving as a blueprint to save the beleaguered city of Sarajevo 44 years later. On 27 September 2017, the Concord Regional Airport, the Berlin Airlift Veterans Association and members of the Civil Air Patrol (CAP) welcomed the C-54 "Spirit of Freedom” to the Concord Regional Airport. The aircraft is one of the last remaining aircraft to have actually participated in the Berlin Airlift. 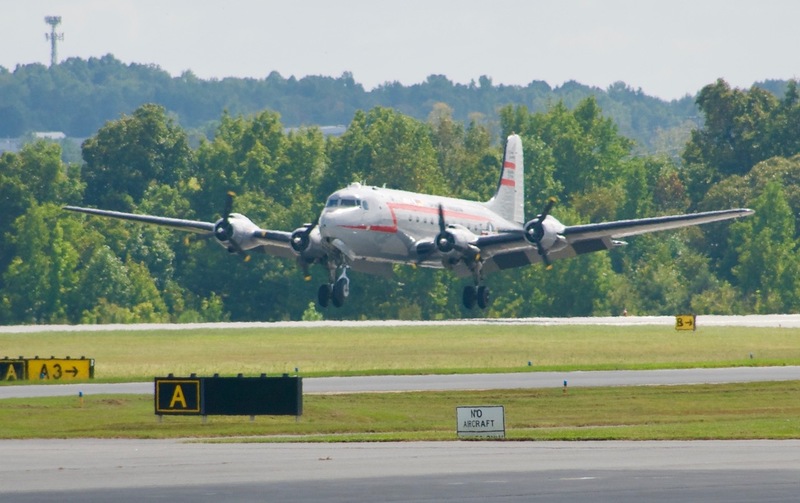 "Our tour stop in Concord is to fulfill our mission of telling the history of the Berlin Airlift, education, and to honor the veterans of the Berlin Airlift," said Timothy A. Chopp, founder and president of the Berlin Airlift Historical Foundation. Eddie Ide, tour coordinator for the Berlin Airlift Reunion Tour, added “we are looking forward to being with veterans and to seeing the many veterans we have become friends with over the years." CAP members from the 121st Charlotte Senior Squadron were on the ground floor of the planning efforts in pulling the event together. Preparations began in August with a team that included Major Brett Benson and 1st Lt Beau Bentley, Rob Walter from the Concord Regional Airport and Eddie Ide from the Berlin Airlift Veterans Association to ensure that all the details were ready prior to the plane's arrival. CAP personnel were necessary to assist with parking visitors and directing them to the main terminal; staffing cordoned ramp areas for safety and security; and providing visitor escorts between the visitor viewing area over to the “Spirit of Freedom” located on the ramp at the Concord Regional Airport. The Civil Air Patrol connection runs deep with the Berlin Airlift as well as with the C-54 "Spirit of Freedom." Two members of the C-54 crew were former members of CAP. Chopp, who joined CAP in 1961, is from Washington, Pennsylvania. “I was only in for two years, but my fondest memory was of the Air Force history lessons and the Link Trainer our squadron had, they’d turn it on and it sounded like a vacuum cleaner as we would all take turns taking it for a spin.” Another CAP member of the crew is Earl Block a former B-29 mechanic who joined CAP in 1948 in Freeland, New Jersey. Block served on the island of Guam during the Korean War and enjoyed his time in service. A retired parts representative, Block has flown as a crewmember on the C-54 for the last 20 years and enjoys seeing the look on the faces of the Berlin Airlift veterans as they return for the reunions. Undoubtedly the most famous Berlin airlift pilot is Colonel Gail Halvorsen. “Without Civil Air Patrol, there wouldn’t have been a Candy Bomber,” said Halvorsen in a phone interview. “I joined CAP in 1941 and was awarded a flight scholarship in 1942 flying a Piper Cub,” added Halvorsen. The 96-year-old Halvorsen calls Provo, Utah home and is planning his last Candy Drop in December at the Manteo Airport. More than 200 veterans, family members and aircraft enthusiast took the time to visit this rare warbird during her brief visit to Concord, but this won’t be her last visit to the area. According to Chopp, the "Spirit of Freedom" will return in November as part of the “Wings Over Monroe” airshow and again to the Tar Heel State in December as part of the annual Manteo Candy Drop. Chopp, president and founder of the foundation, is the aircraft commander of the Spirit of Freedom, and believes the public needs to remember the Berlin Airlift and particularly what people were willing to do to overcome adversity and defeat communism.